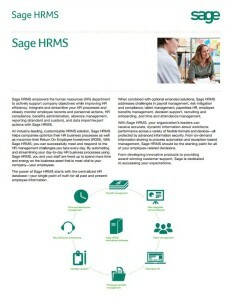 Sage HRMS enables your human resources department to actively support company objectives while improving HR efficiency. With Sage HRMS, you can successfully meet and respond to the HR management challenges you face every day. By automating and streamlining your day-to-day HR business processes using Sage HRMS, you and your staff are freed up to spend more time and energy on the business asset that is most vital to your company—your employees. Fill out the form below to download the brochure now.